Carolina mustard sauce is the perfect accompaniment to any BBQ that features pork. Pulled pork. Smoke roasted pork. Sausages. Whole hog. It just works. The tang of the vinegar, the mustard and that hint of heat from the chili powder. Perfect. Carolina mustard sauce is a fantastic alternative to tomato based sauces. I don’t really get the tomato sauce and pork thing. In general I don’t really get it for anything but chicken. Mustard and pork. That makes sense to me. Or no sauce at all. If you nail your BBQ why hide it? I don’t put ketchup on my roast pork. Not on my ham sandwiches either. Never on a sausage. Why hide your perfect pulled pork? And yet BBQ some pork shoulder, pull it and suddenly everybody wants to drown it in BBQ sauce. See how I might think this is a little strange? I get it if you are serving overcooked pork make in a slow cooker. Then it makes sense. 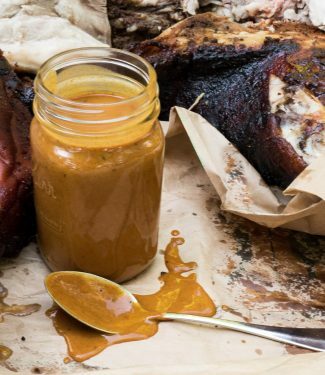 Liquid smoke and BBQ sauce is where your flavour is coming from. Otherwise it’s just boiled pork shoulder. But if you’ve worked hard to make perfect pulled pork. If you’ve smoked it carefully until it’s just right. If you have that beautiful bark and meltingly tender pork. Why hide it? 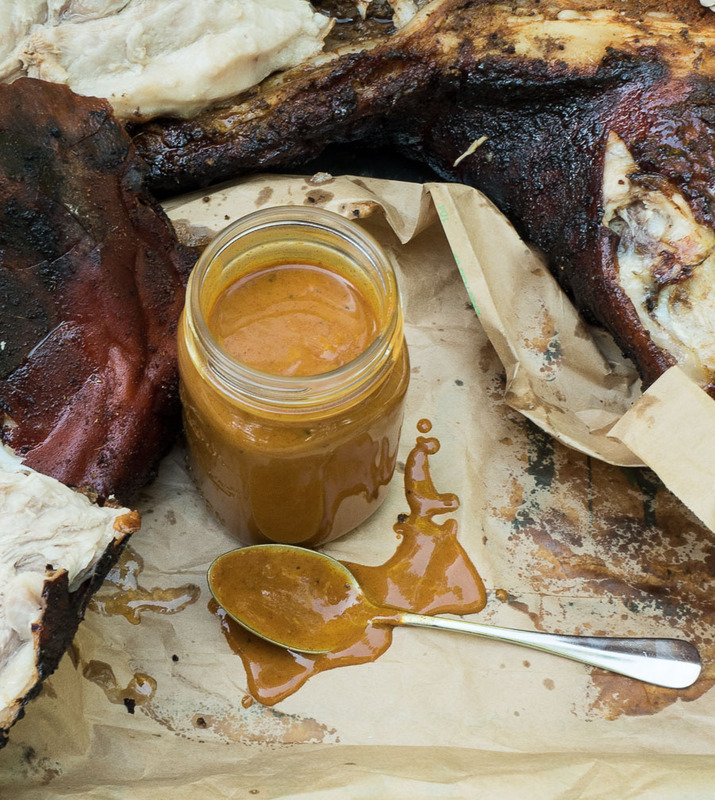 You shouldn’t be tossing your pulled pork in sauce. You worked way too hard to just drown it. Serve Carolina mustard sauce as a condiment. Serve up some red BBQ sauce on the side as well if you must. See which you like better. I know what I like. No contest. The Carolinas are the epicentre of pulled pork goodness. It’s their wheelhouse. And they don’t use ketchup. Never. It’s all about Carolina mustard sauce. Try it sometime. Carolina mustard sauce comes from the heartland of pulled pork. Try it next time you make a batch. Combine all the ingredients in a small saucepan and bring to a simmer. Whisk as required to homogenize the sauce. Serve with pulled pork, smoke roasted pork or sausages.